the login page of Wave. If you have account then don’t worry, just login and you will see full featured wave, also you would be able to comment and reply. I have embedded a Wave bottom of the page as widget, view and leave comment in that widget. Anyway! 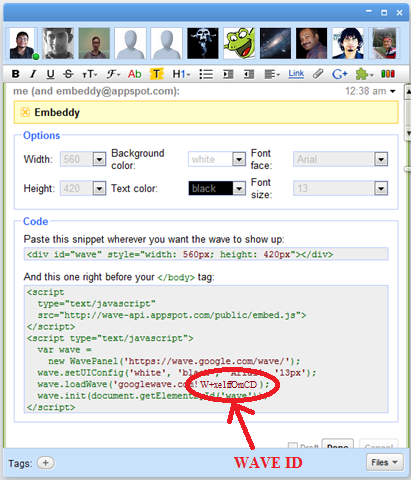 here’s how to embed Google Wave in your blog or website. Update : I have removed wave plugin from bottom of the page, You can still view the wave here : Click to see Wave. and don’t forget to comment. Very first thing to do, you need to know what is your Wave ID ? To know this, simply add embeddy@appspot.com to your contacts, and make Mr. Embeddy to participate/add in the wave which you want to embed. And you are finished with this step. You will see the id like this : ” W+xe1ffOmCD “, but the wave id is only : “ xe1ffOmCD “. Copy this id for use in last step. Adding wave to public. This will enable wave to become public and open to all Wave users. For this you will need to add public@a.gwave.com to you contact. To do this copy this public@a.gwave.com and directly paste to your contact and hit ENTER. Otherwise it will tell that the user doesn’t exist. After this add this public to your wave by simply clicking on add button of wave. Now your wave is in public and anyone can jump into it and participate. 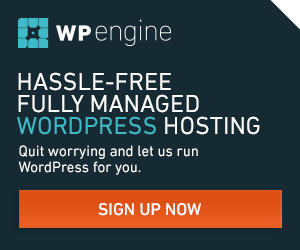 And whats about WordPress ? Heres the code http://pastebin.com/f6cdf11c4 for WordPress, Copy and Insert this before . Now you will be able to embed the wave where ever you want on the blog post. Embedding wave id with html code in the post. Copy and paste this code (Don’t forget to replace the Wave id with your Wave id which you collected in Step – II. Now you are done with this, Publish the Wave. Give it a try and don’t forget to give Feedback. Test mine, it also show at footer, why? @FaizalCheckout, I have updated the post.. I embedded the code into my Blogspot blog. 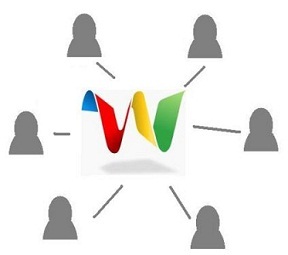 How do I link everything up so that Google Wave users can live comment on the Blog? @Eclipse You need not to link anything, just make the wave public, so that anyone can jump into it and comment.